This religious banner was brought back from Central Asia by the explorer and archaeologist Sir Marc Aurel Stein (1862-1943). It was recovered from Cave 17 of the Mogao Grottoes. This shrine site is one of China’s great Buddhist pilgrimage complexes and is situated near the oasis town of Dunhuang. The shrines were carved out of the gravel conglomerate naturally occurring in the region. The insides of each cave-shrine were painted with coloured murals, some of which survive to this day. By the Tang dynasty (618-906 AD), from which this textile dates, there were a thousand caves decorated with religious scenes. The Cave of the Thousand Buddha, one of several called by that name in the area, is named after a legend concerning a monk’s dream of a thousand Buddhas appearing on a cloud to one side of the valley where the caves are situated. 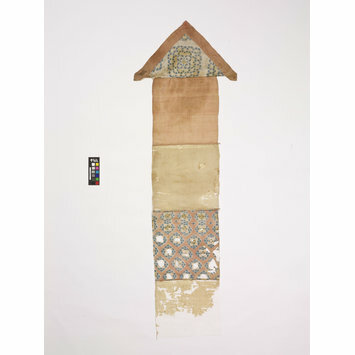 Most of the textiles from this site would have been used as banners or wrappers for religious texts. The site is also part of an area of Central Asia we now call the Silk Road. This term was first used by the German scholar Ferdinand von Ricthofen (1833-1905) and it refers to a series of overland trade routes that crossed Asia from China to Europe. The most notable item traded was silk. Camels and horses were used as pack animals and merchants passed the goods from oasis to oasis. The Silk Road was also important for the exchange of ideas. While silk textiles travelled west from China, Buddhism entered China from India in this way. Banner; head and three body panels intact, with the remains of a fourth. Head consists of a border of monochrome plain weave faded red silk and an infill of monochrome plain weave cream silk with clamp-resist dyed pattern of floral lozenge-shaped clusters in blue, green, orange and yellow. First Panel consists of one piece of monochrome plain weave faded red silk. Second panel consists of one piece of monochrome plain weave yellow silk. Third panel consists of one piece of monochrome plain weave cream silk with all over clamp-resist dyed pattern of repeating floral lozenge shapes in blue and orange on faded red ground, centre of flowers now missing. Fourth panel consists of one piece of monochrome plain weave yellow silk. Four split bamboo panel reinforcements intact. Zhao Feng, ed. 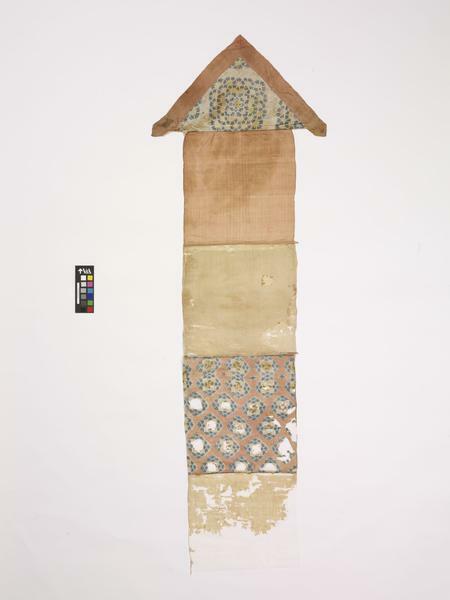 Textiles from Dunhuang in UK Collections. Shanghai: Donghua University Press, 2007. pp. 268.